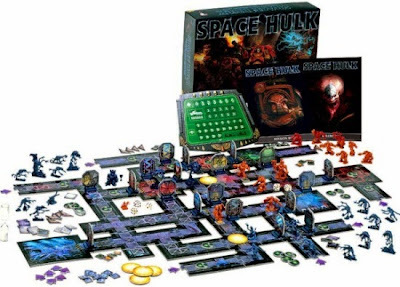 It was recently announced that Games Workshop is going to have a new release of their board game Space Hulk. It is not cheap (Like everything from Games Workshop) it costs $125. I have always liked Space Hulk. Games Workshop is mostly known for their wargame Warhammer 40,000, called 40K by enthusiasts. 40K has so many rules, parts, and armies that it always feels daunting to get into. Space Hulk is 40K lite with limited rules and units. It also has more of story, narrative feeling that I like. It is a 2 player game. One player commands the bad guys who are normally violent creatures called genestealers and the other a crew of space marines who must perform a mission. The Marines have to enter into an asteroid, or a derilect ship find or do what their mission is, while being attacked from the shadows by enemies. The marines know based off a map where their enemies are, but they do not know how many are there. When they turn a corner they could find 1 or 6 enemies in a spot. This gives the game an element of danger and surprise. Similar to dungeons and dragons many players make their own maps and missions making for endless amounts of game play. This particular version of the game looks very slick. The board pieces and mineratures all look very cool. 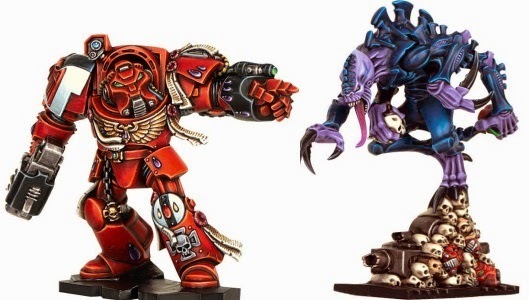 One other new component of this release of Space Hulk is that you can buy additional directions for different types of Space Marines. If you favor one of the Space Marine Chapters you can buy these rules and build missions around them.